Wat Po is the oldest temple in Bangkok and, with its total of 80.000 square metres also the largest in Thailand. The area is located south of the Grand Palace in Bangkok and is surrounded by a high wall with sixteen major ports of which only the two facing Jetupon Rd and is open to the public. The street divides the area into two halves. On one side is the monks' quarters and on the other is the many temples that especially captures the visitor's interest. The whole area has been called Thailand's first university. The reason of course is that the temple has been used as a training site. The monks taught the teachings of the Buddha and many other different subjects, like Medicine, astrology, massage and archaeology. With several fine building inscriptions and frescoes that tells about this. Wat Po was founded in the 1500s and was expanded in 1789 by Rama I, a few after he had made Bangkok the capital city. The first four kings of Chakkri dynasty all had a weakness for Wat Po and they have all joined the new buildings to the temple area. Therefore, one can see everywhere colourful chedi of various sizes. Along with the orange-robed monks, it is precisely the beautiful chedierna that gives the place its very special character. 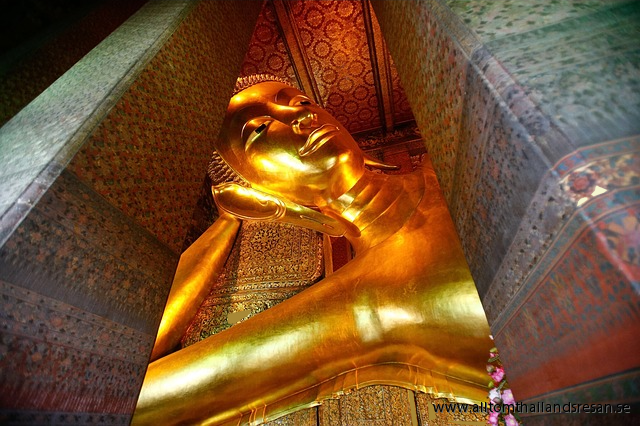 It is also here that Thailand's largest Buddha figures are available. The main entrance, some of the guards have hats and statues are suppose to be Europeans. Asians believed that all Europeans wear hats. The area is surrounded by a variety of small chedi (In the whole area there are 71 pieces small chedi and 20 major, some of them containing the ashes of royal person) in front of the next input is Yva Chinese stone lions, each with a stone ball in the mouth. According to ancient beliefs you should roll the stone ball 3 times to the left. Go through the gate and into the yard. In here is almost 400 hundred gilded Buddha figures in meditation posture, observe that all face shapes are different. In the inner courtyard is one of the most beautiful in Bangkok with its elegant roof with finely detailed ornamentation. The stairs is guarded of beautiful bronze lions. The reliefs in marble that runs all the way around the foundation is also exciting. These were at one time rescued from Ayutthaya's ruins. In total there are 152 pictures depicting events from the Ramakien. Inside the temple sits a bronze Buddha from the 1000's. It is told that Rama I's ashes is hidden in the base. The frescoes on the wall are interesting, but in poor condition. Go back to the main entrance and proceed up to the big four chedierna on the left side. Here are a Hindu phallic figure, to which childless Thais targeted prayers for fertility while sacrificing gold leaf. with frescoes that were used in acupuncture education lies in front of the big chediers. Chediers are lined with porcelain and they were ordered by the first four kings of Chakkri dynasty. Was put up by Rama IV. Now walk to the gate with the two chineese guards. The statues that is 200 years old says to be Marco Polo. Soles of the feet is 5.5 meters high and is beautifully rendered in beautiful marble work depicting buddhas 108 reincarnations. The round discs symbolize the endless reincarnation. Around the buddha figure stands monks begging-bowls. Notice the shutters of wood of which has been cut out of a piece of wood and covered with gold leaf. On the walls glimpsed small images of the living situation in Thailand, but unfortunately these pictures are poorly kept. The library which is covered with pieces of pastel coloured porcelain. In Wat Po, one might also meet a fortune teller and get a traditional Thai massage. Everywhere on the field may be accosted by vendors offering different silk prints with designs from the reliefs or other attractions in Thailand.